An unidentified man was caught last week on surveillance video grabbing a puppy from the Santa Maria animal shelter and tossing the dog over a fence. The suspect then hopped the fence, chased after the puppy and fled. Around 4:30 p.m. on April 13, a man wearing a blue jacket, jeans and a Realtree baseball hat entered the Santa Barbara County Animal Services facility on W. Foster Road in Santa Maria. The man then walked back and forth between the interior of the shelter and the dog kennel area. Upon snatching the puppy, the thief is seen carrying the dog out of the back of the shelter. Shelter workers worry the puppy may have suffered injuries as a result of being tossed over the fence. The puppy, named Riley, is about 7 months old. 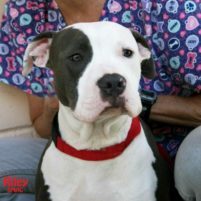 Riley is blue or grey and and white and recently neutered, according to Santa Barbara County Animal Services. Officials request that anyone who has information pertaining to the whereabouts of Riley or his thief call the Santa Maria Police Department at 805-928-3781. Informants call also call the Santa Maria animal shelter at 805-934-6119. He was probably the owner, and did not want to pay to get it back. What won’t people steal these days?